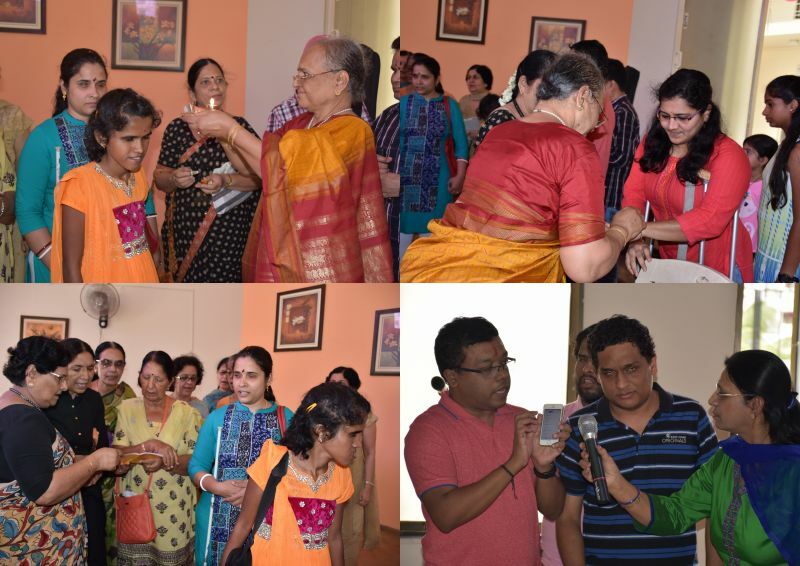 On 18th June 2016, an inclusion event was held at Bangalore called "Unseen Delicacies". This event was one of its own kind-- as the theme was to demonstrate culinary skills of a person having visual disability. I approached Madhur, a volunteer of Servicespace and expressed an interest to organize a cooking event. She was thrilled and we started our planning. Earlier in 2015, the idea of doing an inclusion event came up during my introduction with Nipun Mehta sir, at India Inclusion Summit. Our requirement of having participants cook in front of audience, was best possible in a posh restaurant, which we blocked. However, later due to financial constraints, it was not possible to go there. At this point of time, I felt... it might not work and we will have to cancel the event. But Madhur came up with an idea to conduct it in the common hall of the apartment complex, where she resided. We could not think anything better than this where we can spread the message of our event among all age groups at a time. It also became easy as Senior Citizen Women group of the apartment were very supportive of this idea; and hence we became a team of 30+ people now. Everyone was amazed as they never thought that even visually-challenged can cook and live his/her life independently. They were thrilled with this new project! I was able to get 6 participants who formed3 teams and cooked different dishes. They all were working with MNC's and were either partially or completely blind. A few days before the event, our motherly hosts requested us to go for fire-less cooking due to their concern for safety. They said "We should not allow them to use gas stove, induction- what if they burn themselves or cut their fingers while using knives". "We should have a first aid box" etc. I realized that somewhere essence of the event will be suppressed with this. I suggested to Madhur that I would talk to them directly, during our preparation meeting, a week prior. In the meeting, I explained about the challenges faced in my daily life due to partial vision loss and how I overcome with different solutions; with or without use of technology. They were super impressed with my words and agreed to all my terms of cooking. Madhur was completely surprised to see the change of mind-set from the same group of women had agreed to allow the blind to cook using ignition without any questions or objections. Our hosts had offered to bring food for all guests, later this changed to preparing lunch for all of us at their homes. The cooking event became more inclusive, with this approach! These senior ladies were super-excited and started preparing menu and dividing responsibilities among themselves…. We had invited Richard and Harmeesh, my friends to play guitar, Rajdeep Manwani as our guest speaker. All 3 have visual challenge. Mr. Bal Krishna Birla, was requested to judge the cooking event. They all joyfully accepted the invite and supported the initiative. Ashwin Karthik was also invited to speak but he could not join as he fell sick. He had been really excited and this came as a sad news, a day prior! Finally, the day arrived and we all gathered at our venue. We were welcomed in traditional Indian style and honored with prayers. I was surprised to see the arrangements! An amazing welcome speech by our anchor, Mrs. Chandramukhi touched my heart. We had music and song program; Rajdeep inspired us with a message to believe in ourselves; Mr. Birla also shared about his life and encouraged us to develop will power. We displayed few assistive aids used by a blind person in his daily life to spread awareness e.g. ‘currency recognition wallet, chess board, cane and signature guide’ etc. 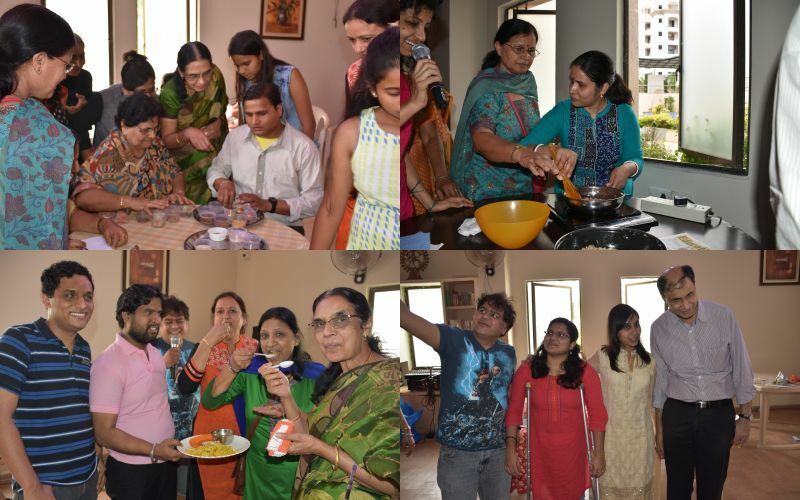 The senior citizen group had organized a fun game for our visually challenged friends: to identify different ingredients used for cooking and articles used at home. Our visually challenged friends used sense of touch, taste & smell to identify these. Now, teams gathered at cooking stations and started their work. Our anchor was interacting with each team. She asked questions around how they identified ingredients, temperature or food consistency etc. Audience were eagerly waiting to taste the delicious food as the aroma of spices and whistle from the pressure cooker was irresistible. Finally, all the 3 teams were ready with their dishes and it was tasted by different set of judges. Judges commented that the food was cooked evenly- ingredients were added as much required, flavors were added by using different spices and even presentation was good. During lunch, there were so many dishes; cooked by our lovely, motherly hosts and those prepared by the cooking event participants. I overheard few ladies sitting behind me, talking about the food cooked by teams. One of them said "the coriander chutney has been prepared exactly like mine. It has the same taste". I was very delighted as this appreciation came from experts having 40-50 years of cooking experience. Babu, who has polio in a leg voluntarily covered our whole event in camera along with another friend. We also gave small gifts to all our contestants, musicians, guests and volunteers. During that day, I only experienced love & kindness all over… All of us held hands many times as required. It brought so much warmth among us and created a strong unseen relationship. The day was truly filled with ‘unseen love and kindness. Caressing touches and smiles made it such a special day…. The participants were amazed at this kind of initiative which was new and much needed. They were delighted to contribute towards spreading awareness about independent living of a differently-abled. Many expressed heart-felt gratitude for being invited as guests. Everyone encouraged us and suggested to do more work around Inclusion. I had been with my mother and she was so happy to see my efforts and love received from all the ladies in the form of blessings. The moment is unforgettable for me as it made my mother to be proud of me. I felt as if I was able to tell her that this is the fruit of your upbringing and love for me. I am thankful to Madhur for believing in my idea and giving it life, without her it would not have been possible. My special thanks to all our host ladies whom I would call young enthusiastic women rather than senior citizens, as they showed true team spirit and were super energetic. My thanks to my friends who participated in cooking, played guitar, sang song, photographers, Rajdeep Sir to motivate us with his words and Birla ji to judge our event. Last but not least the security guards at the gate of apartment who helped all the guests to reach the hall with directions and support. Beautiful reflections and such a wonderful gift to read this!